My main focus is near-field cosmology. This is the use of precision studies of kinematics, dynamics, stellar populations, chemical abundances, ... for the oldest systems in the local universe to deduce the fundamental properties of structure formation and the nature of dark matter in the early Universe. Current survey and 8-m telescopes are superb for this. The revolution has begun! (launched December 2013) the ESA satellite Gaia is revolutionising this field - and many others. The Gaia-ESO Survey is a 450+ Co-I 400+night ESO-VLT Public Spectroscopic Survey. It is the largest large-telescope high-quality stellar spectroscopic survey, complementary to Gaia. The Co-PIs are Gerry Gilmore and Sofia Randich (Arcetri/Florence). 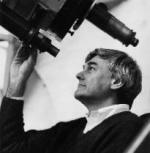 Ph D in New Zealand, 5 years (1979-1984) at the Royal Observatory Edinburgh, since then at IoA Cambridge. Current position: Professor of Experimental Philosophy. FRS. Scientific Coordinator of Opticon, the EC Optical Infrared Coordination Committee for Astronomy; UK PI of the Gaia data processing and analysis consortium; Co-PI of the Gaia-ESO Public Spectroscopic Survey; ERC Advanced Grant holder. PhD; ScD; F Inst Physics. FRS. Member, Academia Europaea. Chalonge Medal.